Will Weekend's March for Equal Inheritance Propel Historic First in Tunisia? 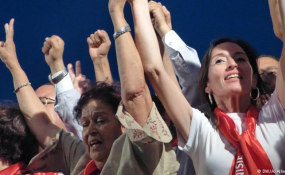 Is Women's Inheritance Next On Reformist Tunisia's Rights Agenda? Tunis/Tunisia — "The presidential initiative to uphold the equal inheritance is the starting point for a dialogue that the Ennahdha movement has already called for in order to bring the views closer," the Movement spokesman Imed Khemiri said Tuesday. In his speech on Monday on Women's Day, President Beji Caïd Essebsi proposed upholding equality inheritance by suggesting a draft law guaranteeing equal inheritance and revising the Personal Status Code (CSP) to keep abreast of social developments and legislation in force, in line with the Constitution of the second republic. The guiding principle shall be to enforce equal inheritance rights, while making room though for the enforcement of Sharia, according to Caid Essebsi. A bill will be submitted to the House of People's Representatives for consideration at the upcoming parliamentary session. Contacted by TAP, Imed Khemiri said "the Committee on Individual Freedoms and Equality (Colibe) was not balanced in its composition, just as it had not faced different opinions." In the message he addressed to the Head of State, the Ennahdha Movement expressed reservations about certain points in the Colibe report, including the question of equal inheritance. "Once the draft law on inheritance equality will be submitted to the parliament, the Movement will discuss this question with responsibility and in the respect of the constants of the party," he said. Ennahdha cannot enact legislation that opposes the text of the Constitution or that threatens to undermine the identity of the people or offend religious feelings, he added. In the same context, Khemiri pointed out that several other issues raised in the report should be the subject of an in-depth dialogue such as capital punishment, moral and physical torture, the rights of foreigners and the conditions for obtaining Tunisian nationality.